Literature Review Guide: How to start? Begin by establishing context, or background, for the argument explored in the rest of the paper. Convey to your reader what knowledge and ideas have been established on a topic. 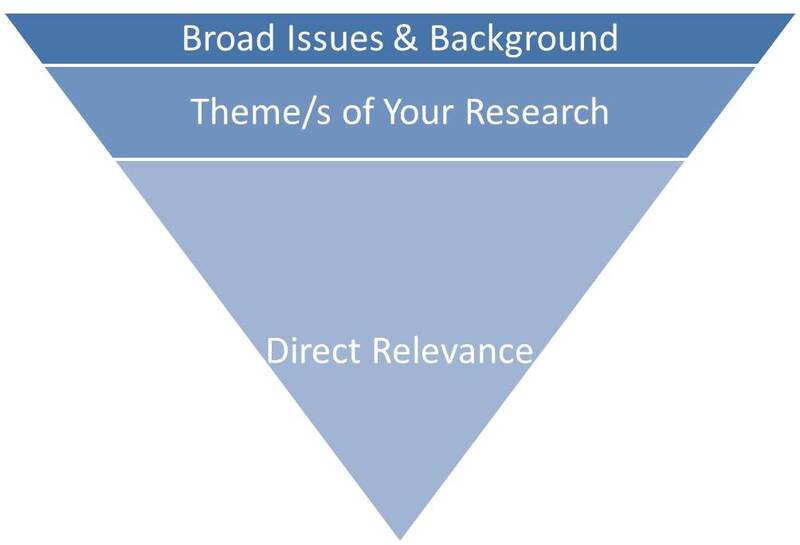 Next, narrow the focus: Discuss literature that aligns with the specific focus of your paper. Give an overview of literature that relates to the theme/s of your research. Spend the most time discussing the sources which are most directly relevant to your research. This lets the reader see what came before, and how you will contribute to the field by moving research forward. There are four stages similar to information research for beginning a literature review. Problem formulation— what is the subject/topic or area being reviewed and what are its component issues? Data evaluation—determining which literature makes a significant contribution to the understanding of the subject and letting go of information clutter. Not everything is relevant. Analysis and interpretation—discussing the findings and conclusions of pertinent literature. You will have to explain to whoever is marking your work why you felt that piece of literature was worth adding. How widely/deeply have you read this subject area? Have the key seminal texts been mentioned? Has there been critical engagement with the literature? You need to give your opinions/commentary on the literature. To what extent is the text adequately referenced? Is there a separate list of references? Are there a reasonable number of recent references? << Previous: What is a Literature Review?